MEDITATION LOUNGE – How to increase our creativity? I would like to share with you one of the practise’s that I started 36 years ago to enhance my daily life . Here is David Lynch ‘s explanations using meditation to increase creativity. Our direction here is to pick up on science research that show that human being to be top of all living species, yet we go through our full life cycle only using maximum of 15% to 20% of our brain capacity and the rest remain domain. Therefore our question in the meditation lounge is how do we increase our creativity and to discuss different techniques that members practice and personally and share the benefited with practical experiences with rest of our GICAS members. We open the platform to discussion and share methods / techniques that are use to increase creativity!!! David Lynch meditates, and he meditates hard. Thank you so much for posting this Sunil! Herminia welcome to our creative lounge on a fine lovely Sunday evening here in the UK. I have been waiting for the best opportunity to introduce this exciting, utopia experience of meditation. I have previously mention in my conversation the topic of meditation but now believe each member should incorporate this simple practise in your daily life to enhance the mind and increase the level of creativity consciousness. I am a practitioner of TM since 1982; duly initiated by Holy Maharshi Mahesh Yogi Direct Disciple and Trainer at New Delhi;; It is wonderful; highly Peace Giving; Creative; Problem Solving and Quietness that you experience; I strongly recommend my friends to be highly Creative and Proactive through Management Of Consciousness’ ;reaching Unified Field Of Consciousness through Practice of TM; twice a Day; 20 minutes; more or less fixed time; in your prefered place ; relaxing; not in any Yogic Posture; closing eyes and going Deep; Within. I will welcome any query from my friends; if that is allowed by your group. All is well with the family Sunil thanks. I think meditation practise will help us to live in harmony and it’ll increase our happiness and freedom. Yes we welcome your help to provide all the support needed so members could ask questions hopefully overtime find a way to begin their practice. Thanks Sunil; it would be my pleasure and joy if I could share my experiences with TM; also guide other members. Sometimes it is by reducing the number of colors or the material you have in your studio that you can create something new. Sometimes it is by taking some material you have never used before so that to put yourself in a new situation…. Behind looking for more creativity there is the idea of what someone is looking for? Very good but more an effort; experimental ; the discussion is to increase your creativity and Meditation helps; in number of ways; may change our perception and lead to more creative concepts; gives alternatives to chose from; your suggestion is also true and appreciated. Great post Sunil, thanks. Meditation is something we all need to push our creativity, what is of great help for many is listing to classical music and almost fall in a state of trance. Good morning Marc hope all is well with you in Italy over here in the UK we are enjoying sunny spells with warmer spring weather. Let us all explore other potential available to us to look for how to increase our creativity. Our main point that we fail to see is right in front of us. We need each others appreciation, and doing more of what we have achieve as a group since Globalization ICAS was formed, as it will be three months to our anniversary of the group. Everyday we come here in our creative lounge to share and exchange ideas and to keep in touch, this caring bond that we have established for one another and believing in the same goals to unite the group as members from around the globe. As creative minds we need to dip into this oasis of positive energy that we created for ourselves. All this is lovely example how collectively we have made it possible to increase our creativity. Talking about our anniversary in August 2013, I would be grateful for ideas of how we could celebrate and make the month of August special. I don’t think there is a ‘one size fits all’ plan and certainly nothing that works 100% for the whole of our lives. Sometimes a method that has worked in the past isn’t enough for present. For me, this discussion shows the benefits of having a diversity of ideas that we can call upon. Meditation is excellent but even with this there are times when it may be necessary to engage with other / extra strategies. I thought Dominique Dumont had a good plan but as a sculptor I decided to introduce colour into my sculpture to ‘see’ my work differently. A writer friend did a piece that excluded the letter O and other artists turn their work upside down or work with the ‘wrong hand’. Any other ideas ? Ranjan or I would like to assist any member interested to use a basic guided practise of meditation to increase their creativity to register here with your name and contact email: or telephone limiting our first group of 20 members. If you name is accepted you’ll become part of our programme to share the progress and development with rest of the members. Sunil, I think you are right about creating the right working space. I find that I am never at a loss for things to do when I am in my studio and I am almost always late for any appointment scheduled after a studio day. However, whatever I do in my studio, I sometimes know that I haven’t made enough of the space or my thinking and I need another dimension to kick start an idea into being something better. It is very interesting to hear what other artists do when faced with a block and as I said previously, it may not be the same thing every time, in fact it may be necessary to do something entirely different. relax……allow 3-5 minutes doing nothing; do not repress or force certain ideas to come in front; try to be neutral; do not give any importance to any thought ( even if it is useful) allow it to go; vanish; and will definitely go away; even if it returns ignore it; Just 5 minutes; eyes closed; At the same time try to relax. when you have control over your self ; get up and work; work with frenzy ; sculpt;let the Form emerge; Studio will never be any more congested; why? you have found Inwaed Space; Boundless. I like Sunni’s Idea; He too is TM practitioner. Alexandra; if you find something refreshing ; Fine; if not just Ignor. More If you need on Sculpting. Morning Alexandra and Ranjan welcome to our Creative lounge over here in UK we enjoying a fine sunny weather with temperatures rising through the day, this should carry through the weekend. Excellent question Alexandra how to cope when you have a block? or suddenly when you find yourself with nothing to do? Ranjan’s solution is a practical exercise of the mind, a simple technique to add into your daily life. You can use it as and when required or even better set a time in morning or in the evening. Once you achieve this process I would say you would be on your way to doing the meditation practise. How many meditative states do you experience and can you explain your transition from one to the next? I find it (to meditate) vary hard. it seems that all thought are coming to my head exactly at that point.. and not going away, i have my studio in my kitchen table…lol. I have sent a message on linked in; please read it. I agree with Sunil; we would welcome serious request for Meditation. Switching from one to another activity without any definite purpose is not the desired way to serious Meditation. ; what Sunil says is correct; for example, before you take or choose direction on your road you wait ; seriously think ; look around ; explore and then decide you direction; and move ahead. Meditation is not any direction; but desired one to reach quietness of mind so that creativity encompass you from all over. more if you want to get the best from Meditation. BE in full consciousness where you are ,close your eyes,smell the air,listen to the sounds and then start opening your eyes very slowly seen blur at first, stay there for a few moments keep on opening slowly until you have clear vision.Try it anywhere ,any time at your discretion.Its one way to see things as new forms and colour.Maybe it works for you. Peter Filzmaier • Hello Ranjan, Thank you for your response and I have sent you a message and i now have another question. Do you thing we can help others through our meditations? As you know we manifest many things in our sense of reality and meditation can resolve many negative situations. Meditation is a serious practice till it becomes part of life; if other benefits why not? the question of negative situations is bound to be there as we repress many things; negative situations have to come in forefront to be resolved; but negative means no repent Veryt interesting question. but with courage to face squarely the the unwanted to vanish or the guilt to be accepted and taken to higher level; I mean at higher consciousness.but embrace with more positive forces. What you have written is absolutely correct; yes in full consciousness; I call it Managing The consciousness and follow what you suggest; nice having your sharing the experience; I am sure the silent spectators will come forward. Hello Sunil & Ranjan, I read carefully all your wise words. I will start practising your advises. i guess it’s time to practice on my self…lol. have a blessed week, i really enjoying talking to you all. Good morning everyone and to Nikolas, Peter Ranjan hope you all had a pleasant weekend break. Nikolas making a start is moving in the right direction as with all intention you begin your first steps to reaching your destination. Very happy to know that you are starting the Meditation. Without any preconception or preconceived ideas about Meditation or what you will get or achieve ; plunging headlong is the best way; I and Sunil are sure you will enjoy; choose your time if you can or do it whenever you want; start any time schedule;10 minutes; 15 or 20 or more; no adverse effect is there ; but you are relaxed and find something new coming up. Best wishes; Share with us; if not openly through private reply; we are sure you will succeed. Thank you all for sharing your experiences with Meditation. I’ll follow the steps. A big hug to you all. a great pleasure and all success. Good morning to you all hope you all had a pleasant weekend as over here in the UK we had Monday bank holiday which made our weekend extend to three days. Big hug to you too!!! Herminia good to hear that you have sign your name to be part of the first twenty members, as both Ranjan and I are keen to help all members that join to get started. Close your eyes in sitting in one corner of your studio; make a space ; then relax……allow 3-5 minutes doing nothing; do not repress or force certain ideas to come in front; try to be neutral; do not give any importance to any thought ( even if it is useful) allow it to go; vanish; and will definitely go away; even if it returns ignore it; Just 5 minutes; eyes closed; At the same time try to relax. Your Name; contract email address or phone. With your reasons why you want to learn meditation? Being surrounded by nature sometimes I find a meditative state looking out the studio window fixating on a tree or a vulture soaring in the sky, or clouds above the tree tops. It’s a form of self hypnosis that uncluttered the mind and lets ideas flow and heightens perception. So that a hush descends upon us. Where all things would find their rest. Everything would then be together in a deep connection. Putting an end to ‘us and them’, this against that. And take us into its arms as a loving friend. Is it a self hypnosis? Or that you have gone beyond your normal live consciousness? Consciousness opens up and when you fix at phenomena (not Objects) the expanded consciousness covers wider field; that is the progress; spend more time with Nature to liberate,; Ah! it is wonderful; stimulating; broadening Vision; more intuitive. Meditation take you to higher plane where we should be to be more original and creative. for sure we are spirits, You are You. There is many Technics now how to increase ability and creativity, Everybody is on the way to freedom, All knowingness is born in us, All is in awareness of awareness, We are spirits for sure, I have experienced it. I think the way how to increase creativity is to create and increase communication with public’s, To be real to people, We create for them. I do not think, than missing O is more understanding, Too much experiments could spoil understanding, just little is ok, to relay message newly. Create and create and more create, can increase creativity and handle Technics to balance it what you like to say. Meditation is not for me the way, although a few have achieved enlightment, there are also blind alleys there. Yes every spirit want be free. Creativity can be also the way.Splarge on the create. Very frank submission. Congratulation. ; We are all separate entity ; what you say Spirit; Anyway you achieve Freedom to pursue one’s goal is the most important approach in Life; Meditation is not only the way; Meditation is not compulsion; Even when the Way (Road-Path ) appears to be very straight and clear; there are blind alleys; we overcome in our own way. I liked you are enjoying your freedom and Being a Spirit. Meeting of wonderful minds around the globe.., improve our level of creativity consciousness.., …, calmness.., revitalize.., and Inner Peace. For an all-round feel-good factor; refresh your energy levels by relaxing your mind and body. Step out of your comfort zone to bring out the best in yourself. Be a self-coach rather than your own worst critic to improve your mood, self-talk and communication skills. Rethink challenges, think opportunities. Rethink problems, think solutions. Understand how to train your mind to shift your attitude and flip negative to positive. Take the stress out of your life. Keep calm and rise above it all. Explore strategies on how to slow down, have more work life balance and strengthen your stress response. Get things done by working smarter, not harder. Develop simple technique to use time effectively and enjoyably, rather than find your life dictated by time! Learn meditation skill that you can practise at your studio or at home. Simple steps – how to de-clutter your head space and go from noisy, busy mind to peace more creative mind. I agree, I meditate many many hours per day. We invite your views; your thoughts; share; request. MAY 2013 – Tuesday 28th in our MEDITATION LOUNGE? Month of May being the fifth month of the year is also an auspicious month of the birth of Buddha. Both today and tomorrow all round the World candles will be lit and celebrated the day. a pure and peaceful mind. and the guidance of virtue. It is good to be back after lovely extended weekends break with the family at the East coast of England – Great Yarmouth spend most times relaxing and meditating on the sandy beach including valuable time with the family. Shortly be posting a questionnaire for all members joining our meditation programme to complete that will help us to follow your development.. Welcome your feedback of finding out how was your weekend? Did anyone get a chance to practise our basic technique of quieting the mind. All the practises your learn in our meditation lounge will help you progress with your own personal practises and more reasons for you to enjoy your path of mediation experience. Most important is to share these experiences here for other members also to benefit. Have a pleasant day being creative !!! I had a little accident. I slipped and fell coming out of the pool and injured my elbow. As I am not prone to seek much medical attention I used meditation to relieve the pain and enhance the body’s healing process. The pain was gone quickly and other than a little swelling the wound is almost healed. I always rescue a time in the afternoons for meditation, try to concentrate in the beats of my heart to remove any thinking and images and when I finish I feel calm and happier. Good to hear your elbow is getting better Peter. Sending best thoughts. Herminia this is the right steps, that is a lovely start our intention to make that first effort to make that leap. Similarly if we all follow the example we all would be moving in the right direction with small steps in completing our goal. If I could ask you all to now introduce our Breathing Meditation practice that I would like you to incorporate into your program. We call it A..B..C A – awareness; B – Breathe; and C – conscious. To practice for minimum 5 minutes if you find it easy to do increase to 10 minutes than up to 20 minutes a day. This program will help to clear your mind make you relax and calm. There are many different forms of meditation this is one of the main practice of Breathe meditation. Meditation is the Stillness within the Silence where Solitude embraces the flow of what ever one is seeking to learn…know and understand… its is arrived at with no effort at all… just like the inward and outward breath. This is how I merge with the creative part of myself in all that i choose to creatively express..
Congratulations. you have a found a WAY. Do you need Solitude to experience Stillness or Quieting Yourself, that is moving into realm of complete silence while Meditating or you reach solitude while not meditating; a thoughtless state of mind and body? I would like to share with you all the importance of our new YOU TUBE video production of Laara Williamsen’s latest collection that combines some of her powerful images of Life and Elements made of Earth, Water, Air, Fire seeing mastery of Laara’s technique mixed with sounds use by musical composer who produces music for deep meditation and calming of the mind. Another medium and program that we would like you all to add to your daily meditation practises. G’Day All, Well I just stumbled on this discussion. I have little knowledge and no interest in meditation. But I do have some knowledge and a great deal of interest in creativity. Creativity is an ability that everyone possesses. It is the ability to solve problems. It is how we all learned language, to walk, to eat and to attempt to solve any problem we encounter on life’s journey. Because creativity is a behaviour it shares characteristics with any other behaviour. One of those is that skill can be developed. Those people who are thought to be, or consider themselves to be, highly creative are those who have developed their problem solving skill. This is done by small incremental steps in the problem difficulty level. 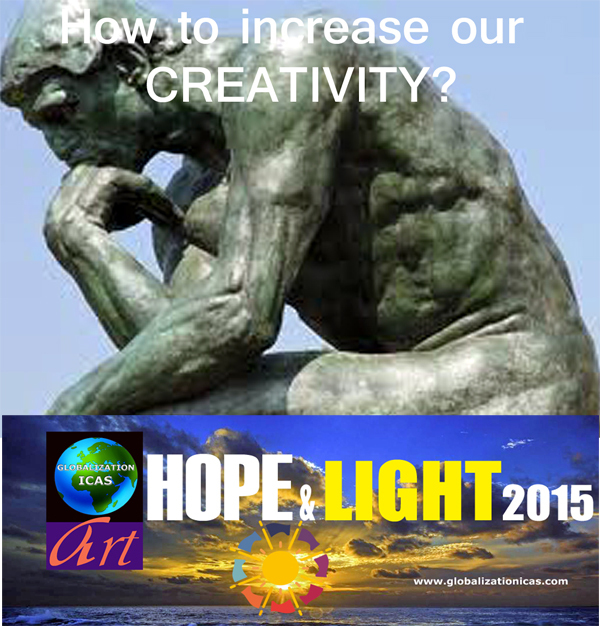 I can offer a program whereby anyone can coach creativity skill in members of any group that meets regularly. I somehow doubt whether meditation helps in this process, but have an open mind, it might. Good morning Edgar & Graeme thank you for joining us in our meditation lounge. It’s always a pleasure to chat and share ideas at the same time develop our knowledge. All our creative lounges are here to connect us live with members around the globe, unable any member to reach out to our full list of members of Globalization ICAS. Graeme I read your comments on creativity and welcome all the different processes, and ideas that members practise to share with members of the group as I am aware there are many program available to improve our creativity. Perhaps you could elaborate more about the program that you coach so that the members of GICAS could have a clearer understanding. It was lovely to touch base today, wish you all a happy smiling restful weekend!!! G’Day Sunil, In answer to your question, your members can find out about SPACE Art Education by visiting the http://www.spacearteducation.com website. pick something up and do something with it! Hello to you all! I learned the way (not totaly yet) of scientific and positive thinking (meditating) from a book that was written in 1912 by Charles.F.Haanel and called ”The Master Key System” Since then my life is better, i am a better person and i can Love more Everything and Everyone! Now i want to read Napoleon Hill and Deepac Chopra. Your conversation and the informations you are shearing are very interesting! Read about a kabbalistic model of creative process in my book “The Future of Art in a Postdigital Age” (Intellect Books/University of Chicago Press). It explores creativity at it highest levels based upon analysis of my interviews of prominent artists and scientists (artists in Who’s Who in American Art and scientists – Nobel laureates and member of US Academy of Sciences). G’Day Mel, What does kabbalistic mean? I see the kabbalistic experience as a realization of reality to it’s creative source. The creative process is one of solution seeking through one’s inner self and is a meditative state that is accelerated through transcendental meditation allowing the consciousness to enhance the intuition, the pathway to the source of reality, the intelligence of creation, the universal connection of self to all that exists. The practice of transcendental meditation expands perception and breaks down subjective perception revealing an objective understanding of self and the unity of individuality within all that exists. G’Day Peter, I’d agree that creativity (creative process) is one of solution seeking. I doubt the rest. Hello Graeme, I always learn from other peoples points of view so please elaborate and share your doubts. I help people according to their needs. G’Day Peter, That’s great to hear. I do not intend to get into a debate about your views however, as previously requested by Sunil, you can access mine at http://www.spacearteducation.com . Good morning Graeme thank you for your respond to my question, firstly may I clarify some procedures as members we are all free to ask questions and request for a reply. To than be requested to go to your website which once again require one to join and register on your website would be look upon as a way of promoting yourself. So therefore a simply reply would be most welcome!!! I think most creative people are those who have shown great curiosity, observing and studying nature as Leonardo da Vinci. For this I think you should always pay attention to everything around us, the sky and the stars, if you ride detention observe the landscape, the trees, in order to always try to learn more and more. I have also noticed that when there is distress or pain some artists have been able to make great creative work because it is more sensitive, also happened to Vincent Van Gogh who took refuge in art. Diana has a very positive method of dealing with increasing creativity, it feels based on ‘doing something’ and for me that does seem useful. If I can force myself at difficult times into making or drawing, then usually some good comes out of it. When the going is tough, getting out the notebook and pencil can be really painful and when the results are dire that is even worse. When it works, then it is amazing. Overall this has been a really thought provoking discussion, thanks to all for some stimulating debate. Edgar, My thoughts of well wishes are with you and the man on the motorcycle. It is fortunate that no one was seriously injured. and it is good that you move from retrospection to meditation to remove the stress of the experience from your mind. Such experiences are most unfortunate. May you both recover from this experience reafirming the value of being. Es ist eine gute Nachricht, dass beide, du und das Motorrad Mann, nicht schwer verletzt sind, während die Sachschäden immer reparabel sind. Nimm meine aufrichtigen Wünsche entgegen! Positiven Gedanken! Dear Edgar, it is a good news that both, you and the motorcycle man, are not seriously injured, while the material damage is always repairable. Sending you good wishes and positive thoughts. … ich vermute, dass du deutsch sprichst? … welche ist deine Muttersprache? Edgar, I’ll have you and the motorcycle man in my thougths this sunday of Meditation. I tend to be most creative when I prevent my mind from being creative kinda of like forgetting i prepped a canvas the night before then showing up a day later with an uncontrollable desire to project my inner most feelings, as if charging a battery waiting for the green light so i could use it.Not thinking of anything till it is time to attack!. Art of war or war of art!? I like to think that my spirit is in control of my creativitity and my mind simply knows the tools and techniques my spirit taught it! I guess its more so of an attempt to leave my ego out of the equation so as to make better purer work! Beautiful experience and still better, What a wonderful atmosphere you are creating! Laara lovely to hear from you hope all is well with you? I see you are taking part in the Peace Art exhibition Good Luck to you from all your family here at GICAS..
Wishing all of you peace, happiness and well being and the people of the Philippines, speedy recovery from their disaster with much help from the rest of the world. May we come to realize when one suffers we all suffer and let how we treat our children and animals be the test of our morality and humanity for they can not help them selves. A day of contemplation and pleasant thoughts of the beauty of just being alive realizing the best should always be found in today so that it can reflect itself in the days to come. Afternoon of calm and concentration, sending best thoughts and good vibes to our people in Philippines, wishing a quick recovery. Hello Pablo,I use meditation to achieve a state of mind that is a state of consciousness that for most people comes moments before sleep. To me it is an inner consciousness that touches creation. It is a state of being consciously aware yet being unaffected by outer influences. I use this as a means of soliciting creative images, and a platform for prayer in healing and well wishing. It also helps me to deal with negative perspectives and affirming optimism. trough out my creative life as an artist using different expressions, i have noticed its a go between each of them: some periods need lines and colours, very simple, to express clear and strong feelings, others need heavy materials, dark colours, sometimes, films, videos are the only way to say what i want to say or show, recently, i have used the writing and drawings together, its a kind of respiration: the ” air “comes in and goes out, all the events of life push me in one of these periods… they can be 7 years long or less if the events are very difficult or sudden. for me, creativity and life are close to eachother, inseparable… i have never tried meditation yet,it might be another experience now, reading the comments is questionning me. Hello Riene, I took the opportunity to visit your web site. I was impressed by the work and found it deeply original and very expressive of you as an artist. I look forward to your participation in GICAS. thank you for posting this sunil. i watched the david lynch 9minute video last night and went to bed thinking about it. it’s very interesting. i think i meditate in my own way (with favourite music playing and relaxation) in order to get into that ‘zone’ just before painting, but i now plan on doing research on transcendental meditation. ‘have not had time to read everybody’s comments yet. there is a 2hour video as well – i shall watch that later, looking forward to it. I saw the David Lynch video today. Loved every minute of it:) So well said, about the meditation’s effect on ”creativity” and about the One-Ness. Thanks for this info. It’s always a pleasure to hear from our members who keep regular touch with us here in our Creative / Meditation lounge. Hello to Gulnar hope all is well with you? To follow our discussion on creative flowing we started as a group to explore all possibilities to increase our creativity and meditation is an excellent opportunity. I admire his point of view. Generous, essential. Here’s someone who transmit good things for next generations ! Meeting of wonderful minds around the globe.., following the path of creativity.., sharing of precious moments with one another.., making new friendships and finding new ways of increasing our Creativity, by opening our self to our ONE GLOBAL family. Good Evening everyone .., Hello, Namaste! Bonjour!, Salute!, Shalom! And Nǐ hǎo!! It’s lovely to see many new members settling down by introducing themselves and also asking questions, an slowly joining us in our Meditation lounge. Hello to Lucía Borrallo, Elisa Cosme and Dominique Gais thank you for your comment and link to an interesting video talk by Elizabeth Gilbert on the Ted .com. show. Our direction here was to pick up on the points that science research has shown that human being to be top of all living species, yet we go through our full life cycle only using maximum of 15% to 20% of our brain capacity and the rest remain domain. Therefore our question in the meditation lounge was how do we increase our creativity and to discuss different techniques that our members have used or practiced and personally benefited to be able to share with rest of our members. Meditation practice is one of the methods that have shown positive results, and it’s very different from our meditative painting practice that we experience whiles we painting. Firstly we are not in control or able to channel the lovely energy that we release while exercising our creative minds. May I remind all members who would like to join us for our 16th WORLD MEDITATION for PEACE & HEALING on Sunday 30 November that involves all our GICAS members around the globe to complete a marathon of a 24 hours program, only takes 20 to 30 minutes of each member’s time? Thanks so much for sharing this! I’ve practiced meditation and chanting for 20 years and find it makes all the difference in the world for what I create, and how my day goes. Why not change the channel to a higher frequency and create from there, whatever form of meditation or spiritual practice you choose to use! I’ve found it very interesting and useful to explore the use of different sounds etc. to see their influence on my work. What a wonderful way to share our thoughts and exchange ideas between our united Global family.., as it also enable us to exercise our CREATIVE MINDS.., Today like to share with you ALL, a simple technique that is easy to follow and everyone should incorporate in their daily routine. We call it as STOP B. technique that we will all get familiar and overtime that every time we see the image or receive a text or email.., it means we STOP for three minute break and just take deep breathe and concentrate breathing IN & OUT filling our lungs and body with rush of fresh AIR and Oxygen feeling Refresh and Energise that we slowly return back to continue whatever we were doing. . Photographer, writer & performer. 0.5 Lecturer in Film & Media at Manchester Metropolitan University. Living life mindfully creates a constant meditation and many creative people have immediate access to this indirectly through their creations. Meditation frees up the mind to go deeper and penetrate into pure states of joy and so forth. It is great to try differing practices out and then to work steadily on the most appropriate types. ………in my most humble opinion I believe, meditation is the “door” to let us step at “bridge” that we can connect our soul, with the universal mind, where is come from the real creativity. meditation technique are a lot, but the most important thing to me is get that connection!! G’Day Sunil, Well I have never meditated. Never even felt the need to (I’m 78). But I’m not arguing against those that do. However I have spent many years considering creativity and developing related programs. It’s my belief that no-one can increase their creativity for it’s something we all have (from birth). Basically it’s our ability to solve problems. But what we can do, and do do, is get better at creativity (solving problems). After a certain point in life other people provide ready made solutions to problems so we practice our creativity a little less and our creativity skill does not develop further. The barrier to growing creativity skill is other people. They interfere. That’s where meditation may have a part to play.